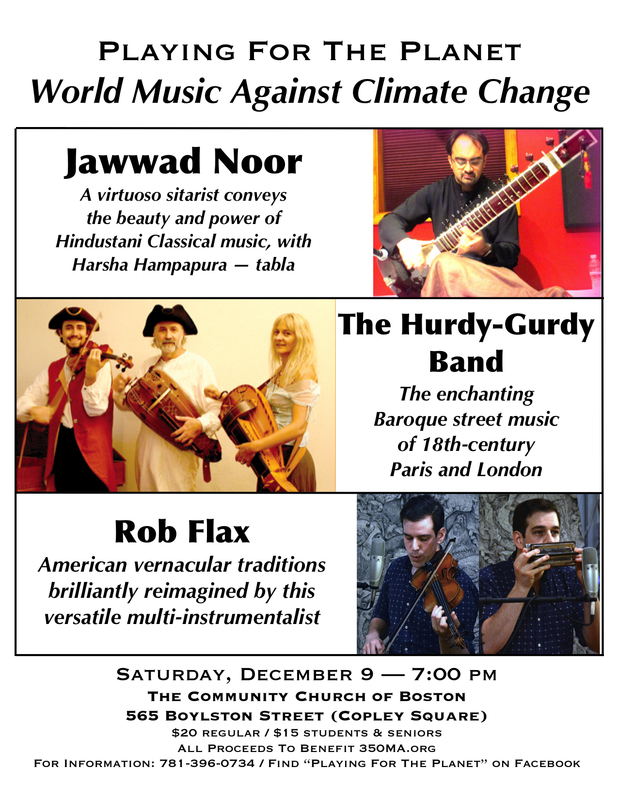 On Saturday, December 8, the eighteenth “Playing For The Planet” benefit concert will showcase master musicians from three different musical traditions in a rare and joyful pan-cultural evening, with all proceeds going to benefit the environmental advocacy group 350MA.org. 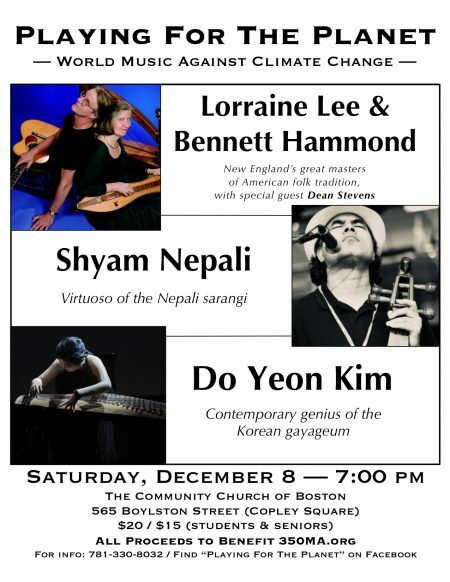 The lineup includes Do Yeon Kim, the contemporary virtuoso of the Korean gayageum, Nepalese sarangi master Shyam Nepali, and New England’s great exponents of American folk tradition, Lorraine Lee & Bennett Hammond. The music begins at 7:00 pm, at The Community Church Of Boston, 565 Boylston Street (Copley Square), Boston. Admission is $20; $15 students & seniors. 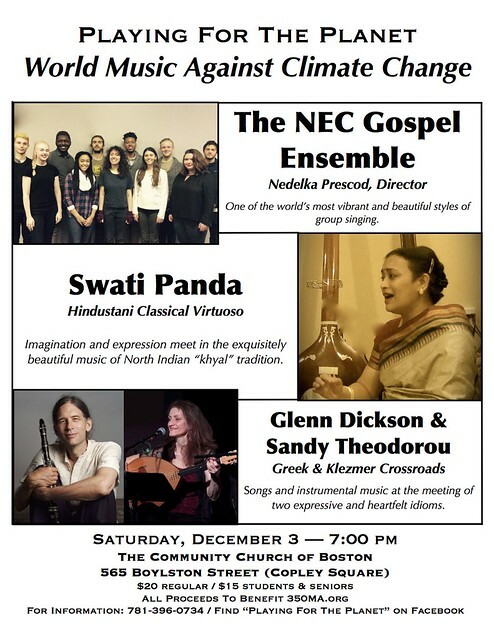 This concert is the eighteenth in an ongoing series of cross-cultural events produced by Boston-area musician and environmental activist Warren Senders, conceived as a way for creative musicians to contribute to the urgent struggle against global warming. Their choice of beneficiary, 350MA.org, is focused on building global consensus on reduction of atmospheric CO2 levels — action which climatologists agree is necessary to avoid catastrophic outcomes. Because the climate problem recognizes no national boundaries, the artists represent musical styles from three different parts of the globe, and share key musical values: listening, honesty, creativity, and respect. And, of course, they are all committed to raising awareness of the potentially devastating effects of global warming. It’ll be an incredible evening of powerful music — from some of the finest musicians in New England and the world. Lorraine Lee, renowned master of the Appalachian dulcimer, also plays banjo, mandolin and Celtic harp and is an expressive singer and songwriter. 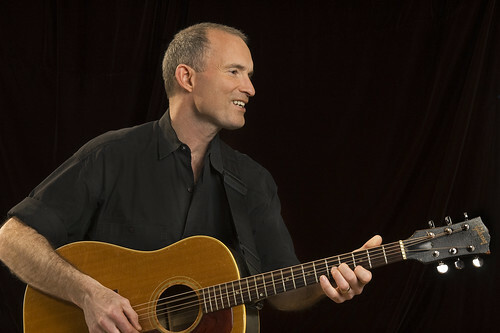 Bennett, a superb finger-style guitarist and recent convert to the five string banjo, names “the three Bs”, Bach, the blues and Buddy Holly, as major influences. 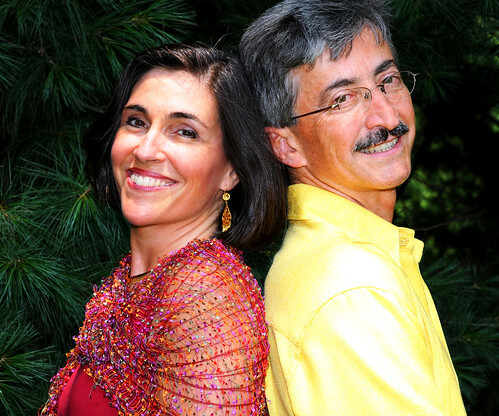 The Brookline-based duo’s repertoire ranges in style from classical through Celtic, blues and contemporary. They sing both traditional and original songs and can be heard on over thirty recordings as featured artists, or enhancing the work of performers including Archie Fisher, Lui Collins and Bob Franke. Christine Lavin and Heidi Mueller are among the artists who have covered Hammond originals. 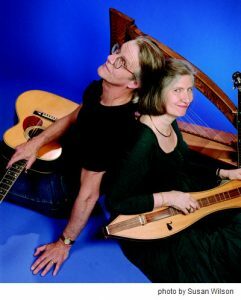 Lorraine and Bennett’s most recent releases include Jingalo Gypsy, Rockafolky Banjo, and Lorraine’s Muddy River Suite. On December 8, Lorraine and Bennett will be joined by special guest Dean Stevens. 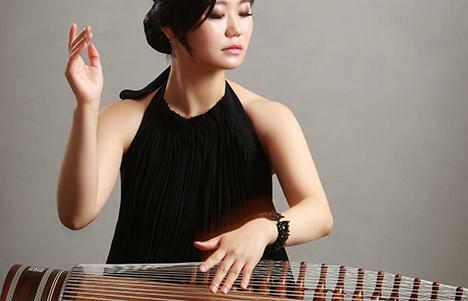 Do Yeon Kim plays the gayageum, a Korean silk-stringed zither. An early prodigy on the instrument, she has received numerous awards in her native Korea, and was selected by the Korean Department of Culture to be one of the few gayageum musicians to tour with a youth group to Japan. She is the first gayageum player at the New England Conservatory of Music, where she received a Masters degree in Contemporary Improvisation, following her undergraduate degree in Korean music. 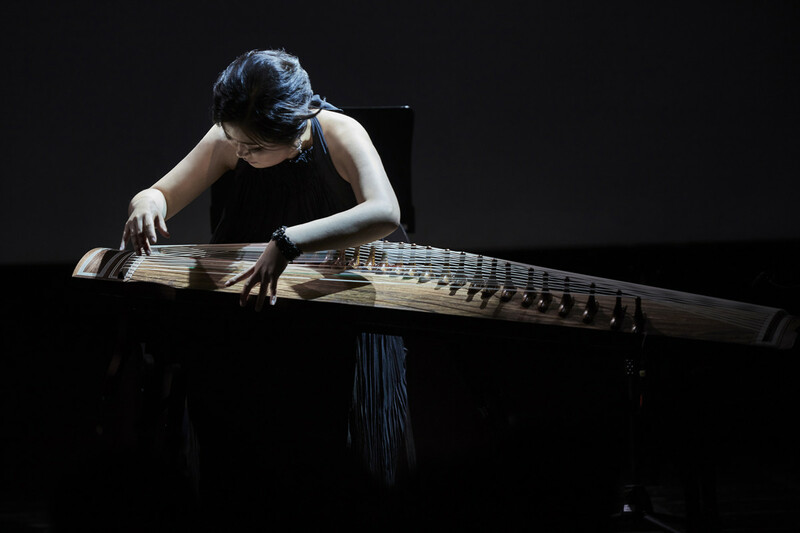 Do Yeon is committed to introducing the western world to the national instrument of her homeland and expanding the gayageum’s boundaries. In addition to playing Korean traditional music, Do Yeon is an exceptional improvisor who has collaborated with musicians from many genres, including tango, jazz, and Western classical music. Her musical vision and ability to adopt styles and forms not associated with her instrument is truly extraordinary. 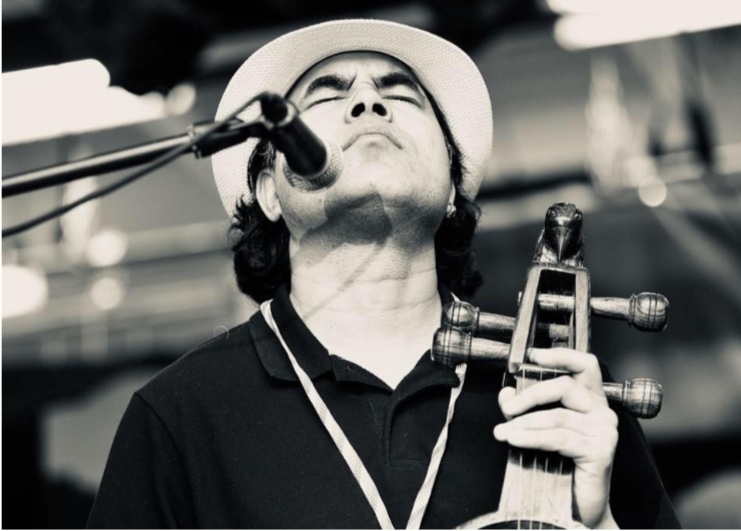 Hailing from the centuries-old Gandharba musical tradition of Nepal, Shyam Nepali been bringing the sounds of the Sarangi to audiences around the world for three decades. His superb musicianship has allowed the traditional sound of the Sarangi to travel in new directions, whether it’s blending the traditional folk music of Nepal with other styles or finding entirely new sounds through creative improvisation and collaboration. His virtuosity and musicianship allows him to fearlessly expand the Sarangi’s expressive capabilities with every note. 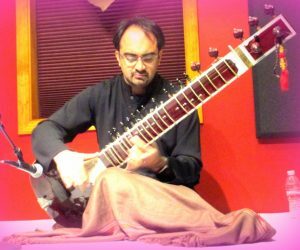 Shyam has recorded and performed with artists such as Patti Smith, Tenzin Chogyal, and Abigail Washburn. An important teacher and mentor of the next generations of Sarangi players, he works with Project Sarangi in Nepal, and the Imagine Rainbow Project (Switzerland/Nepal), to foster the creative arts and keep the traditions alive. The founder of the Himalayan Heritage Cultural Academy in Boston, MA, a platform for Nepali folk music and dance in the USA, Shyam has taught and mentored the newest generation of Sarangi players and folk musicians including members of the Nepali supergroups Kutumba, Sakchyam, Nayan, Manda, Lakchya, Shree Tara, and Lakhay. 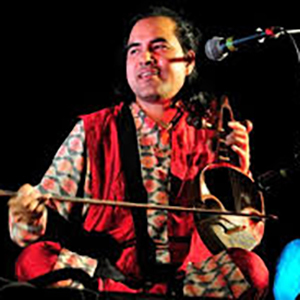 Awards and recognition of his significant contribution to Nepali folk music and the Sarangi around the world include the Mah Kwah Cha award from the government of Nepal, the Governor’s Citation from the Commonwealth of Massachusetts, and an honorary consulship from the Italian government. Mark your calendars for one of the year’s most exciting musical events! 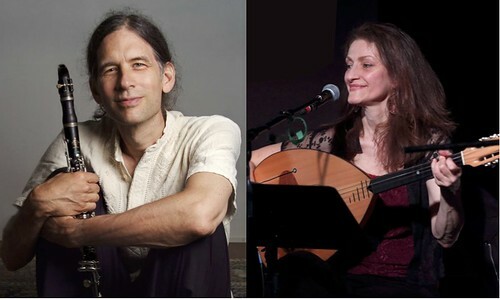 On Saturday, June 2, the seventeenth “Playing For The Planet” benefit concert showcases master musicians from three different musical traditions, in a benefit for the environmental advocacy group 350MA.org. 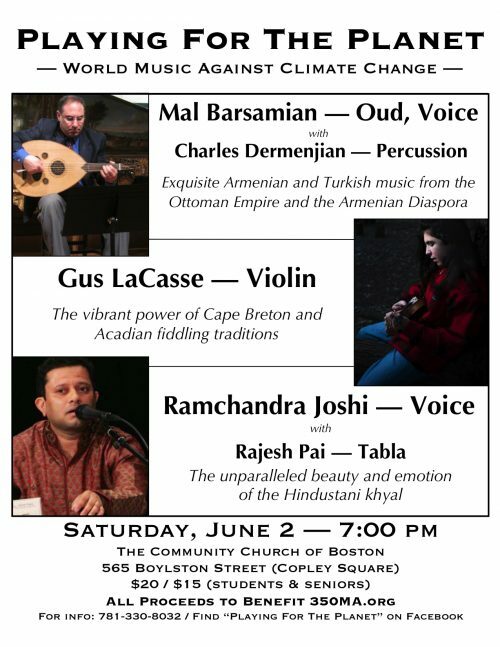 Come and hear Mal Barsamian and Charles Dermenjian performing Armenian and Turkish music, Gus LaCasse’s Acadian & Cape Breton fiddling, and a Hindustani performance by vocalist Ramchandra Joshi. The music begins at 7:00 pm, at The Community Church Of Boston, 565 Boylston Street (Copley Square), Boston. For further information, please call 781-330-8032. “Playing For The Planet: World Music Against Climate Change” is the seventeenth concert in an ongoing series of cross-cultural events produced by Boston-area musician and environmental activist Warren Senders. These concerts were conceived as a way for creative musicians to contribute to the urgent struggle against global warming. Their choice of beneficiary, 350MA.org, is focused on building global consensus on reduction of atmospheric CO2 levels — action which climatologists agree is necessary to avoid catastrophic outcomes. 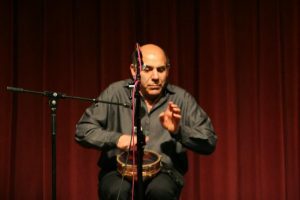 Mal Barsamian’s musical career began when he was four years old playing the doumbek (hand drum) with his father Leo Barsamian at an Armenian picnic. 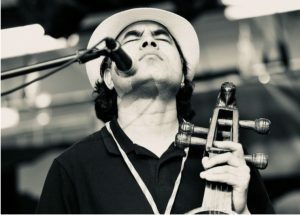 Mal comes from a family of oud players starting with his grandfather, great-uncle, his uncle and of course his father. He has gone on to become a sought-after oud player (lute) and clarinetist as well as other instruments such as doumbek, guitar, bouzouki, and saxophone in Armenian, Greek, and Middle Eastern communities for forty years throughout the country. 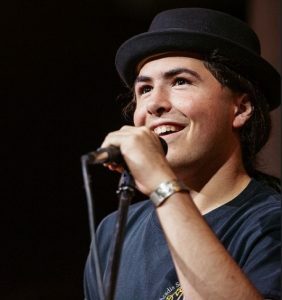 He performed with the late Esber Korporcu, an important figure in Boston’s Middle-Eastern music community, and has also appeared with Mehmet Sanlikol’s Dunya organization. Mal is a specialist in music written by Armenian composers active in Istanbul during the later years of the Ottoman Empire. Also trained as a classical guitarist, he obtained his Bachelor’s and Master’s degrees in classical guitar performance studying with Robert Paul Sullivan from the New England Conservatory of Music. 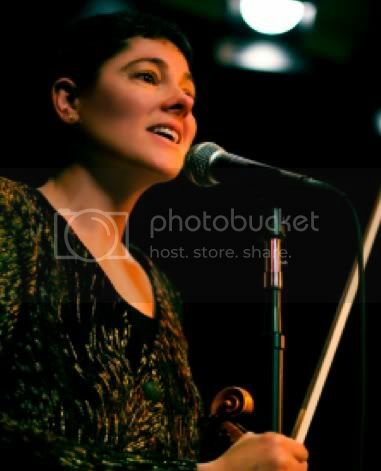 Mal is on the applied faculty staff at Tufts University’s World Music Department, teaching oud, saxophone, clarinet and percussion, an applied faculty member at Boston College and also leads the Middle Eastern Ensemble at New England Conservatory of Music. Charles Dermenjian plays percussion, featuring the doumbek, the most commonly played percussive instrument throughout Middle Eastern cultures, and has performed extensively both across the United States and abroad. 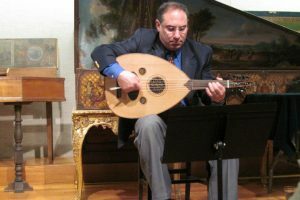 In addition to playing with numerous Middle Eastern musicians, Charles has performed locally with Stan Strickland, as well as several Berkley College faculty. Aside from performing, Charles has devised and applied specific rhythmic teachings as a form of meditative group therapy. A folk fiddler with both speed and savage energy, Gus La Casse’s repertoire reflects his innovative spirit and dedication to the Cape Breton and Acadian fiddle traditions, playing both standards of the genre and his original material. 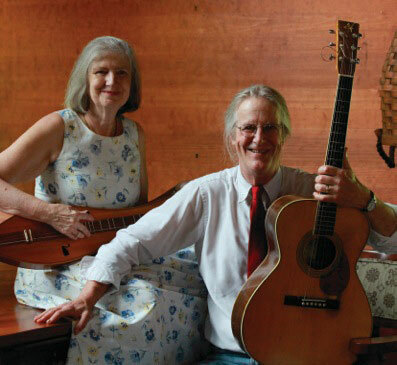 Based in Downeast Maine, Gus maintains an active performance schedule as a solo artist and with other musicians including guitarist Peter Lindquist, rock-to-world-music band Big Tree and a contra dance trio. An accomplished vocalist and harmonium player, Ramchandra Joshi was introduced to the world of music at the age of 8 by his mother Smt Anjani Tilak, a disciple of Pt Manikbua thakursdas. He has trained with Smt. 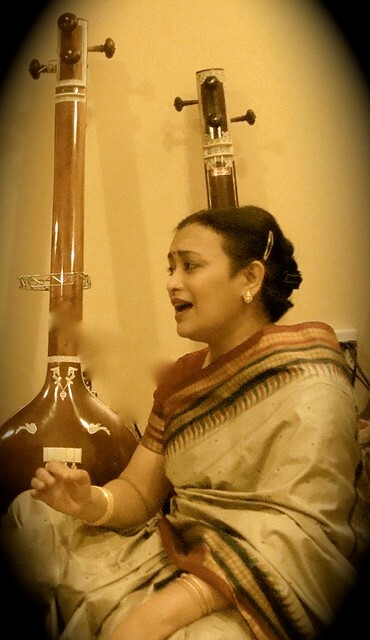 Tulika Ghosh, a disciple of Pt Gyanprakash Ghosh from Kolkata, at Sangeet Mahabharati Music Academy in Mumbai. Ramchandra Joshi’s Gayaki is inspired by the legendary vocalist from Gwalior Gharana Dr.Veena Sahasrabuddhe, with whom he performed on several occasions, notably the 1994 Malhar Festival at the Nehru Cente. A specialist in khyal, thumri, natyasangeet, bhavgeet, bhajans and ghazals, he has toured extensively in India, USA, UK and Switzerland. Ramchandra holds B+ Grade from All India Radio. As a harmonium accompanist Ramchandra has performed alongside many senior and junior artists like Arati Ankalikar-Tikekar, Konkana Banerjee, Sanhita Nandi,Girish Chatterjee, Sandeep Bhattacharya, Rahul Deshpande, Mahesh Kale, and many more. He has lived in the United States since 2003. 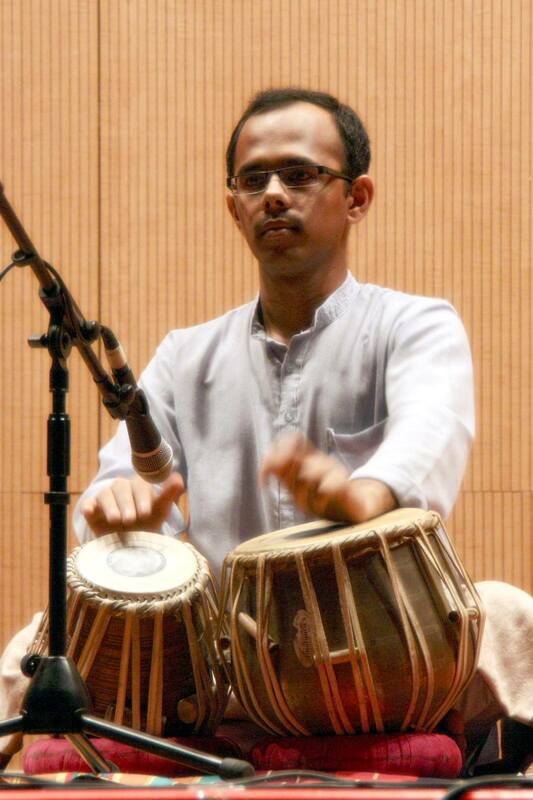 On June 2, Ramchandra Joshi will be accompanied by Sri Rajesh Pai on tabla. 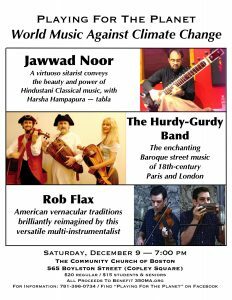 On Saturday, December 9, the sixteenth “Playing For The Planet” benefit concert showcases master musicians from three different musical traditions, in a benefit for the environmental advocacy group 350MA.org. Come and hear Rob Flax‘ genre-bending solo performance, the enthralling and hypnotic music of the Hurdy-Gurdy Band, and the exquisite ragas of master sitarist Jawwad Noor. For further information, please call 781-396-0734. 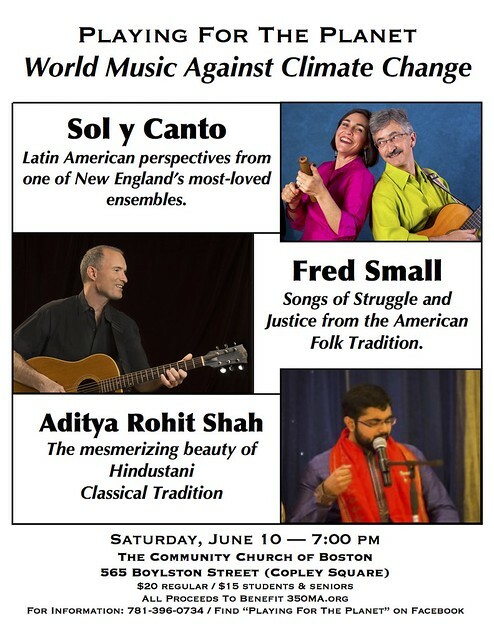 “Playing For The Planet: World Music Against Climate Change” is the sixteenth concert in an ongoing series of cross-cultural events produced by Boston-area musician and environmental activist Warren Senders. These concerts were conceived as a way for creative musicians to contribute to the urgent struggle against global warming. Their beneficiary, 350MA.org, is focused on building global consensus on reduction of atmospheric CO2 levels — action which climatologists agree is necessary to avoid catastrophic outcomes. Jawwad Noor was initiated into sitar by Ustad Alam Khan of Lahore. He went on to become a disciple of the world’s leading sitarist, Ustad Shahid Parvez Khan, under whose exacting standards he extensively studies the melodic and rhythmic fou ndations of the music and trains to play the sitar in the vocal idiom. Jawwad has been bringing his impassioned performances to audiences regularly and widely for many years. He is a senior instructor of the Shahid Parvez Khan Academy, and teaches at the LearnQuest Academy of Music. On December 10, he will be accompanied on tabla by Harsha Hampapura, who first studied with Shri Ram Hegde Keremane, and has been learning the Punjab style from Shri Anup Joshi for the past 6 years. 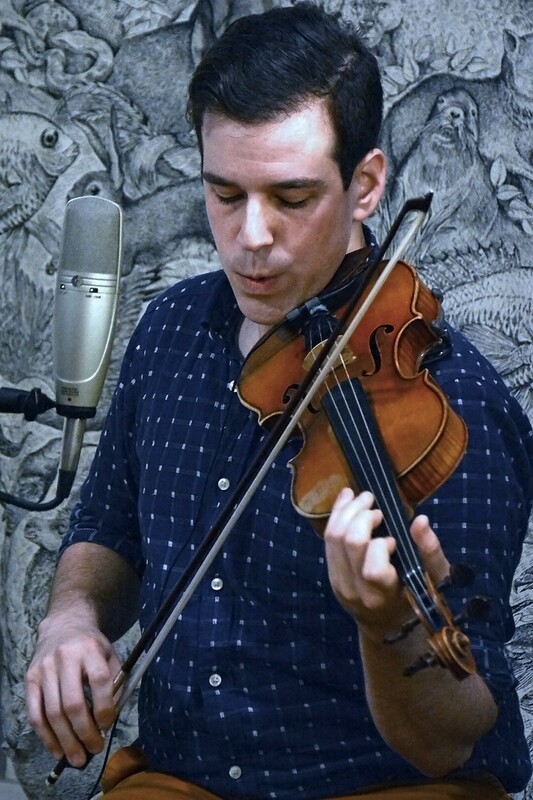 Multi-instrumentalist Rob Flax describes his music in a concise way: “I play things with strings, I hit stuff, and I sing.” Behind this simple tag line lies a rich depth of genre-bending, from classical and jazz violin to bluegrass fiddle, to blues and rock influences, and beyond. In his “One Man Band” shows, Rob uses a looper pedal and other effects to transform his violin into an entire symphony of sounds. The Hurdy-Gurdy is a mechanical violin played all over Europe since the Middle Ages. It combines drones, melody and percussive rhythms to cast a powerful spell on listeners. 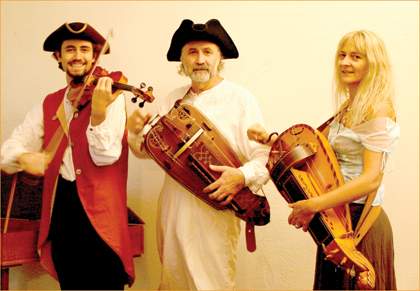 The Hurdy-Gurdy Band was formed in 1979 by Donald Heller and Anicét Mikolai. Since then, they have performed throughout Europe, Canada and the United States. Inspired by the traditions of the itinerant (and sometimes pitifully poor) Hurdy-Gurdy players heard in the streets of 18th Century Paris and London, the Hurdy-Gurdy Band breathes new life into an all but lost art. On December 9 they will be joined by their son Julien Heller, on violin. PLEASE NOTE: CCNOW IS EXPERIENCING PROBLEMS AND WE ARE WORKING ON IT. PLEASE USE THE EVENTBRITE LINK TO PURCHASE TICKETS BY PAYPAL INSTEAD. OUR APOLOGIES!!! 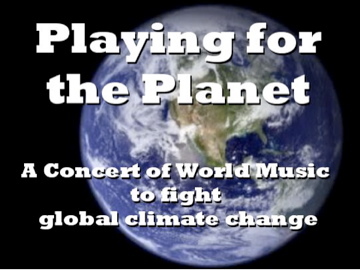 On Saturday, June 10, the fifteenth “Playing For The Planet” benefit concert will showcase master musicians from three different musical traditions in a rare and joyful pan-cultural evening, with all proceeds going to benefit the environmental advocacy group 350MA.org. The performers include the joyful Latin American perspectives of Sol y Canto, the enthralling North Indian vocal music of Aditya Rohit Shah, and the Rev. Fred Small’s compelling songs of struggle and justice. The music begins at 7:00 pm, at The Community Church Of Boston, 565 Boylston Street (Copley Square), Boston. Admission is $20; $15 students & seniors. “Playing For The Planet: World Music Against Climate Change” is the fifteenth concert in an ongoing series of cross-cultural events produced by Boston-area musician and environmental activist Warren Senders. These concerts were conceived as a way for creative musicians to contribute to the urgent struggle against global warming. Their choice of beneficiary, 350MA.org, is focused on building global consensus on reduction of atmospheric CO2 levels — action which climatologists agree is necessary to avoid catastrophic outcomes. Advance orders will be accepted until 3 pm on June 10. Puerto Rican/Argentine singer and bongo player Rosi Amador and New Mexican guitarist and composer Brian Amador have been lucky enough to spend more than two decades composing, arranging and performing music that moves people inside and out; songs that combine poetic lyrics, commitment to social change, and sabor, the “tastiness” of music that draws you into its story or makes you want to get up and dance. Sol y Canto, their three-time Boston Music Award winning Latin roots ensemble, is the culmination of their musical vision. Featuring Rosi’s crystalline voice and Brian’s lush Spanish guitar, they’ve established a reputation for their quirky original compositions addressing life, love and social justice. Since 1994, Sol y Canto has brought audiences to their feet from the Kennedy Center, the White House, and Boston’s Symphony Hall, the California World Music Festival and Puerto Rico’s Museo de Arte to the Kimmel Center in Philadelphia. 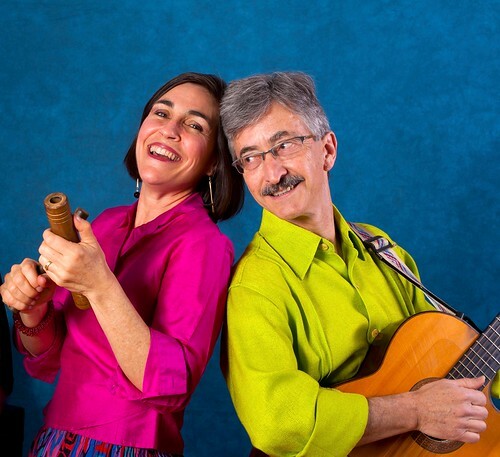 Sol y Canto is known for making their music accessible to Spanish- and non-Spanish speaking audiences of all ages. People en Español Magazine selected Rosi and Brian for its 2007 “Stars of the Year” issue, highlighting four inspiring Hispanics who have used their passion, conviction, creativity and self discovery to achieve success. A Chicano/Gringo mongrel from Albuquerque, New Mexico, Brian was one of the founding members of Flor de Caña, arranging much of the band’s material and co-producing two recordings. He studied classical guitar, composition, and improvisation at New England Conservatory of Music in Boston, and flamenco guitar in Albuquerque and Madrid. For five years Brian was principal guitarist of the Ramón de los Reyes Spanish Dance Theatre. Brian’s guitar style is as mixed as his heritage, combining flamenco, classical, Cuban son, Latin American styles, and jazz. Of Argentine and Puerto Rican heritage, Rosi’s performer parents passed on to her their love of Latin American rhythms and musical styles. Her mother was a dancer, a singer and an actress. She appeared in the U.S. on Broadway, in Europe with Bob Hope, Jerry Lewis and Dean Martin among others, and in Mexico with comic actor “Cantinflas” (Mario Moreno). Her father began in radio in Buenos Aires and later became an actor, touring all over Latin America. With ten years of training as a classical singer, Rosi has been deeply influenced by popular Latin music, jazz, North American folk, blues and contemporary African vocal styles. Find Sol y Canto online! Aditya Rohit Shah, 23, grew up in Pune, India, where he began his musical training under Shri Sanjay Kadam of the Gwalior Gharānā. Since 2007, he has trained in North Indian Classical Vocal Music under the guidance and blessings of Pandit Rattan Mohan Sharma and Pandit Radharman Kirtane, direct disciples of his Bade-Guruji Sangeet Martand Padmavibhushan Pandit Jasraj-ji. In 2012, Aditya was selected to perform a solo concert for Dr. A.P.J. Abdul Kalam, the former President of India. He won First Place in his age category in SwarGanga’s prestigious “Crescendo” National Competition (USA & Canada) in 2013. In 2013, he was deeply honored to receive the prestigious “Mewati Pradeept” award from the Pandit Jasraj Institute, which marked the commencement of his solo musical career. He is deeply thankful to have the heartfelt blessings of his Bade-Guruji. 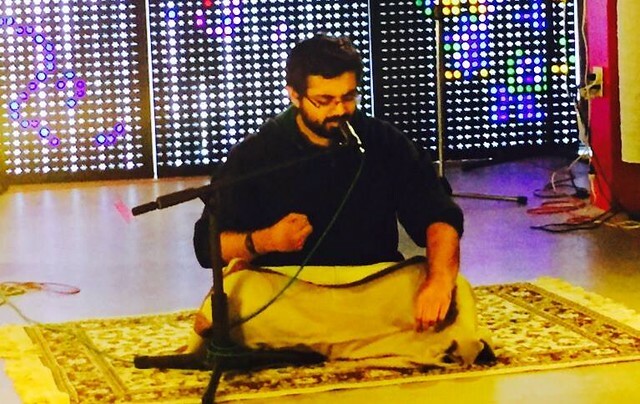 With his Gurus’ blessings, he has performed at many venues in the States, India, and the UK. He graduated from Dartmouth College in June 2015, where he studied History and Economics. He is also currently working on several musical projects, including a debut classical album and an album of devotional Jain hymns. 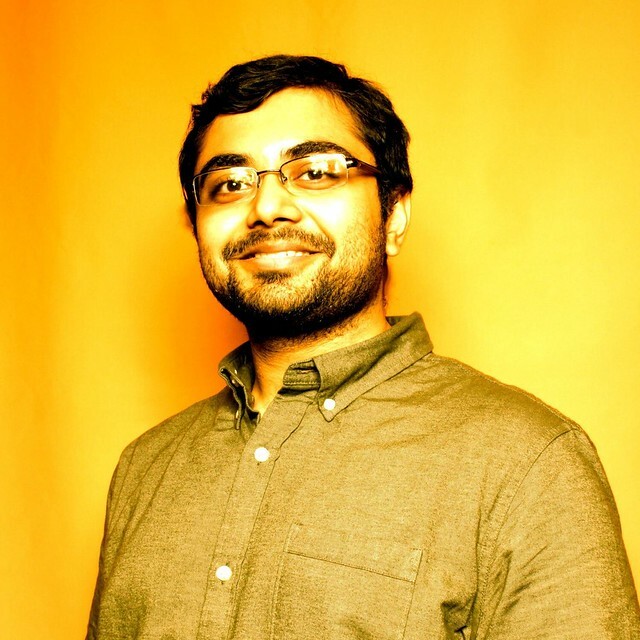 He recently released a music video of the Kabir Poem, “Jhini Jhini Chadariya.” An Inbound Sales Consultant at HubSpot, he is a faculty member at LearnQuest. 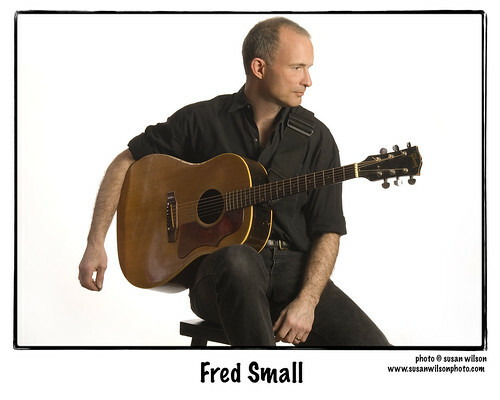 Hailed by Pete Seeger as “one of America’s best songwriters,” Fred Small sings songs of conscience in the tradition of Pete Seeger, Tom Paxton, and Holly Near. Powerful, affecting, and inviting, Fred’s songs illuminate the goodness and courage of all kinds of people. Pete Seeger, Peggy Seeger, Rosalie Sorrels, Steve Gillette, Judy Small (no relation), Roy Bailey, the Flirtations, and the Boston Gay Men’s Chorus are among the singers who have interpreted Fred’s songs to audiences around the world. Fred’s song “The Heart of the Appaloosa” was elected to the All-Time Bluegrass Hit Parade by WAMU Radio in Washington, DC In 1992, Heart Strings, the nationally touring AIDS-benefit musical, chose Fred’s empowering lullaby “Everything Possible” as its grand finale. In 2000, the National Organization of Men against Sexism (NOMAS) honored Fred for his contributions to gender justice. Fred has released eight albums: Live at First Parish (Aquifer, 2009), Only Love (Aquifer, 2001), Everything Possible (Flying Fish, 1993), Jaguar (Flying Fish, 1991), I Will Stand Fast (Flying Fish, 1988), No Limit (Rounder, 1985), The Heart of the Appaloosa, 1983) (all Flying Fish and Rounder titles available at this link), and Love’s Gonna Carry Us (Aquifer, 1981). Fred’s two songbooks, Promises Worth Keeping (1994) and Breaking from the Line (1986) are published by Yellow Moon Press. Fred Small was born November 6, 1952, in Plainfield, NJ. Grandnephew of Thomas Hart Benton, the American regionalist painter (and outstanding harmonica player), Fred was playing guitar and singing folk songs by age seven. After graduating Phi Beta Kappa from Yale, Fred earned a law degree and a masters in natural resources policy at the University of Michigan. He wrote his first song in 1974 on the morning of his first law school examination. In 1980 Fred left his position as staff attorney at the Conservation Law Foundation to pursue his career in music full time. In 1999, Fred was awarded his Master of Divinity degree from Harvard Divinity School. After serving First Church Unitarian in Littleton, MA, and First Parish in Cambridge, MA, in 2015 Fred left parish ministry to devote his energies to climate activism, especially among people of faith. He is now Minister for Climate Justice at Arlington Street Church, Boston. Fred has performed throughout the United States as well as in Japan, Australia, England, and Canada. He has appeared at the Philadelphia, Vancouver, Winnipeg, and Kerrville Folk Festivals, Lunenburg (NS) Folk Harbour Festival, Sidmouth (UK) Folk Arts Festival, National Folk Festival of Australia, Great Hudson River Revival, Great River Traditional Music & Crafts Festival (LaCrosse, WI), Woody Guthrie Tribute (Tulsa, OK), Bread and Roses Labor Heritage Festival (Lawrence, MA), and the Musicians United for Safe Energy (MUSE) rally in New York City. The videos and sound recordings of the “Singing The Long Now” concert are now uploaded! It was an extraordinary experience to prepare this material for performance, and to review it after the fact. Tufts University did a fine job with both audio and video, and I really enjoyed getting the pieces formatted and organized for this page. Please let me know your thoughts. I’m presenting them all in order on this page, with some links to supplementary material as needed. 1. Hymn theme: “The Great Ocean Of Truth” / Raga Puriya Dhanashri: Alap, Khyal in 7 beats, Tarana in 12 beats. Raga Puriya Dhanashri is usually meant for performance in the early evening. This suite of traditional Hindustani compositions is arranged for voice and string trio; the instrumental ensemble plays a redistribution of the standard accompaniment parts in support of vocal improvisation. The introductory alap is sung on open vowels and vocables, the medium-tempo khyal has a text in Braj (an archaic Hindi dialect) describing a scene from the life of Krishna, and the fast tarana is set entirely to non-lexical syllables. Bob Dylan’s jeremiad is recomposed in Raga Mishra Dhani, the new melodic setting evoking both the apocalyptic surrealism of “Old Weird America” and the convoluted, polysemic language of the Urdu ghazal. The strings’ churning undercurrent hews to the basic 6-beat structure of the Hindustani Dadra taal, but can just as easily be heard as a group of rowdy country fiddlers. This composition is built around the ritualized use of silence at different tempo levels. Every performer has a variety of pre-established melodic/rhythmic patterns, punctuated by extemporized “omissions” — this means that when (and how often) to be silent becomes the main focus of creative choice. Even segments of virtuoso free improvisation are built around the idea that the notes unplayed and unheard are the sweetest, the most expressive, the most crucial. 4. Pete Seeger’s melodic setting of Malvina Reynolds’ lyrics (reflecting the words of the first astronauts to view our planet from space) is given a free rendering, with the strings providing a colotomic structure, timbrally aligned with the beautiful music of Sundanese tradition. You’d think they’d get along, and fill their sunlit days with song. To use the time that runs, among the distant suns. A reading from my ongoing intersectional activism/performance project, now in its seventy-fourth week of rush hour mornings at Medford’s Roosevelt Circle. Like Paris’ Centre Pompidou, this composition for intoning voices and instruments wears its infrastructure on the outside. To say anything more in these notes would be redundant, except to note that the complete texts of the spoken parts can be found here. E.B. White’s words, Pete Seeger’s melody — my arrangement of this love song is a kind of “folk minimalism,” using asynchronous repetition of simple melodic phrases to create background textures that allow the melodic line and its meaning to unfold. A thin, premeditated rig, to use in rising. She builds a ladder to the place, from where she started. 8. The great jazz innovator Ornette Coleman once remarked, “I wish people would play my tunes with different changes every time, so there would be all the more variety in the performance.” Whenever we approach Ornette’s music, we try to keep this in mind. “What reason could I give to live? Only that I love you. How many times must I die for love? Only when I’m without you. Where will the world be, if not in the sky when I die? What reason could I give to live? A meditation on time, trees, and light — followed by a thumri composition in the morning raga Kalingda. Set to the slow 16-beat chachar tala, this song in Braj extols the beauty of the new morning light, the songs of birds, the effulgence of opening blossoms — a tender, optimistic meditation on possibility and the inevitability of rebirth. 10. The title of this piece references one famous quote from Isaac Newton, and the text is another equally well-known remark from the great scientist (here altered slightly in the interest of gender equity). The words are set to three different eleven-beat structures in medium, fast, and slow tempi. On Saturday, November 7, the twelfth “Playing For The Planet” benefit concert will showcase master musicians from three different musical traditions in a rare evening of pan-cultural improvisation, with all proceeds going to benefit the environmental advocacy group 350MA.org. The performers include flute master Geni Skendo’s “Astronauts of Albania,” the boundary-bending explorations of the Strings Theory Trio, and the acclaimed Hindustani vocal music of Smt. Shuchita Rao. The music begins at 7:00 pm, at The Community Church Of Boston, 565 Boylston Street (Copley Square), Boston. Admission is $20; $15 students & seniors. For information, please call 781-396-0734, or visit the event website at www.warrensenders.com. Advance orders will be accepted until 3 pm on November 7. “Playing For The Planet: World Music Against Climate Change” is the twelfth concert in an ongoing series of cross-cultural events produced by Boston-area musician and environmental activist Warren Senders. These concerts were conceived as a way for creative musicians to contribute to the urgent struggle against global warming. Their choice of beneficiary, 350MA.org, is focused on building global consensus on reduction of atmospheric CO2 levels — action which climatologists agree is necessary to avoid catastrophic outcomes. Combining idiomatic flexibility, a deep wellspring of creativity, and world-class virtuosity, violinist Mimi Rabson is one of the Boston area’s most valuable musical resources — and her String Theory Trio is a uniquely compelling synthesis of classical chamber music and directed improvisation, bringing together some of Rabson’s most important influences and inspirations. 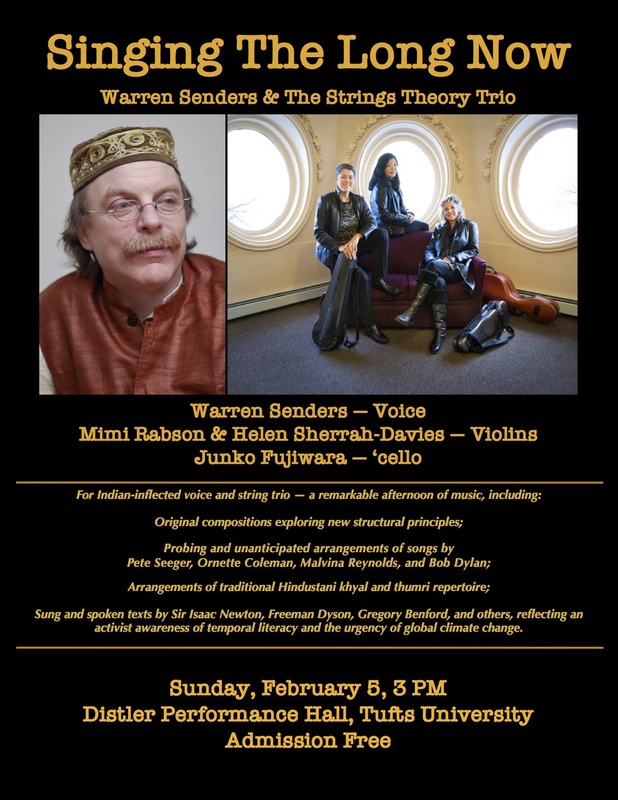 With Rabson and Helen Sherrah-Davies on five string violins and Junko Fujiwara on cello, the String Theory Trio supercharges the intimate atmosphere of chamber music with a triple dose of edgy, daring improvisation. The listener is treated to experiencing Western classical tradition anew; the surging counterpoint and crystalline instrumental sonorities gain new resilience and allure from their origin in the inspiration of the moment. Simultaneously delicate and dangerous, the Strings Theory Trio’s music is richly nuanced and deeply satisfying. Mimi Rabson has played in more different contexts, styles and venues than most performers can even imagine. She has appeared on “The Late Show with David Letterman,” performed with Itzhak Perlman on the recording “In the Fiddler’s House,” and was featured in “A Jumpin’ Night in the Garden of Eden,” a documentary film about Klezmer music. Her composition “Klezzified” was featured on Saturday Night Live. RESQ (aka Really Eclectic String Quartet), founded by Rabson, performs her original compositions in addition to her arrangements of jazz, funk, fusion, gospel, and Latin music. A founding member of the Klezmer Conservatory Band, Rabson worked with that organization for many years, touring as well as recording, composing, and acting as their musical director. Rabson is currently an Associate Professor at Berklee College of Music. Junko Fujiwara is both a creative musician/improviser and an active classical player performing in varying venues throughout the East Coast and the Midwest. Her current performing groups include: BOLT: Adventurous Improvised Music, the Mimi Rabson Trio, the Eric Hofbauer Quintet, Evocation Trio, and the Di Evano Project. Fujiwara is also a member of the Kalliope Piano Trio and a semi-regular performer with the Metal & Glass Ensemble. A member of the cello faculty at Boston College, she is an active teacher in many school systems and also maintains a studio of private students. Fujiwara holds degrees in music from Northwestern University and Lawrence University in Appleton, Wisconsin. Helen Sherrah-Davies, a native of Britain, is a graduate of both Berklee College of Music and the New England Conservatory. International credits include recording with Herbie Flowers (Sky/T Rex) in the UK, performing with Jon Lord (Deep Purple) in Switzerland, at the wedding of “Posh Spice” to David Beckham in Ireland, Montepulciano Opera Festival Orchestra in Italy, and recently at an International Music Festival in the West Bank, Palestine, also teaching at Al Kamandjati in Ramallah. Stateside credits include performing with Simon Shaheen, with the Arabic Fusion ensemble, ZilZala, Mimi Rabson’s Power Trio Project, singer song-writer Alan Williams’, “Birdsong at Morning” and the J Way Jazz String Quartet. Summer 2012 saw her explore microtonal notes between “the notes” with monster guitarist Dave “Fuze” Fiuczynski’s unique “Planet Microjam Institute” at the Jazz Festival in Genoa, Italy. Sherrah-Davies is currently on the faculty of Berklee College of Music. Shuchita Rao was born in a family of music lovers in Hyderabad, India. Her initial training in Hindustani Vocal Classical music was with Dr. N.K.Karhade. Later, she trained under the noted Gwalior Gharana exponent Smt. Malini Rajurkar. She has also received guidance from Padma Bhushan Dr. Prabha Atre, Padmashri Shri Ramakant Gundecha, Pandit Ajay Pohankar and Pandit Vinayak Torvi. 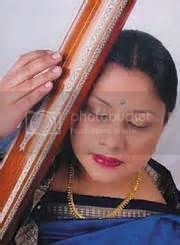 Shuchita is proficient in Hindustani classical music as well as Hindustani semi classical music (Thumri, Dadra, Ghazals). She began performing at a very young age and was regularly featured on All India Radio, Hyderabad. She has won several honors and awards for her singing. Shuchita freelances on the subjects of Indian Music, Dance and Culture and has written for Indian newspapers/magazines such as Sruti magazine, Times of India, TheHansIndia and Indian Express. In the U.S, she has written for Lokvani, Khabar Magazine and is the arts correspondent for the newspaper India New England. 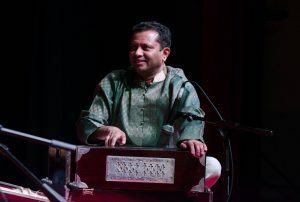 On November 7, Shuchita Rao will be accompanied by Sri Rajesh Pai on the tabla, and Sri Christopher Pereji on harmonium. The Boston Globe calls Geni Skendo a “virtuoso,” who creates a unique blend of jazz, free jazz and world music. Geni leads the Albanian/Jazz/Ambience group “Astronauts of Albania” and the free improvised chamber music group, Samurai Jazz Trio, consisting of shakuhachi, bass/shamisen and piano. 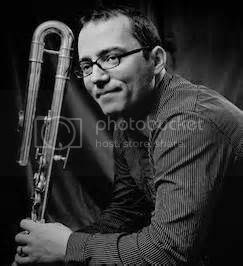 After a successful performing career in his native Albania, Geni moved to the US in 2003 to raise his jazz playing to a higher level. 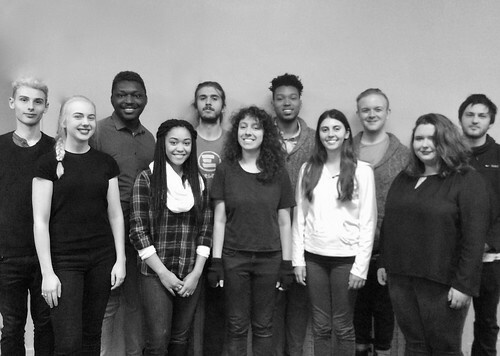 Studies at the Berklee College of Music and The New England Conservatory (MM) led to a deep, ongoing involvement with the Boston music scene. Geni performs with Mr. Ho’s Orchestrotica (Best World Music Act, Boston Phoenix Readers’ Poll, 2012), in both its quartet and big-band incarnations. The quartet utilizes Geni’s full palette, while the big band relies heavily on Geni’s powerful bass flute in its recreation of long-lost arrangements by the legendary Mexican arranger Juan Garcia Esquivel. Geni’s most recent CD is “Acoustic Cowboy,” featuring original compositions and new arrangements of songs from Olivier Messiaen, African pygmies and the Balkans. Astronauts of Albania performs Albanian folk music arranged for Shakuhachi & Bass Flute, Oud, Guitar, Bass and Drums. The band’s music seamlessly integrates complex Balkan grooves with free improvised sections, punctuating hypnotic textures with dazzling solo sections.